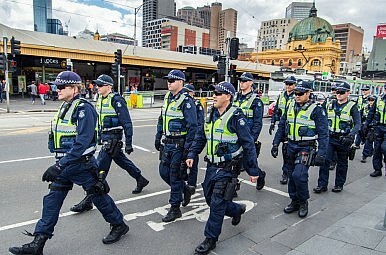 The hype over a recent court ruling refusing a media request to reveal the identity of a 17-year-old boy arrested over the “Mother’s Day bomb plot“ quite aptly exemplifies the hysteria that permeates Australia’s anti-terror climate. Under the law governing the children’s court, the media cannot disclose the boy’s personal details including his religion. Yet, the media’s anxiety to reveal the boy’s details is pressing. The bad apples in the community must be named and shamed. And the public concern over the perennial threat of terrorism has to be alleviated by putting a name and face to the object of their worst fears. However, the absence of these specific details does not in anyway hinder the media from constructing the terrorist personality. The substantive issues (or at least those considered substantive for public consumption) can still be published and made available for social scrutiny. While legal proceedings take their own course, media commentary and public discourse on the case will leave no stone unturned to put all the pieces of the puzzle together from which will emerge the all-too-familiar “extremist” character of this faceless, nameless teenager. As noted above, the media is not allowed to disclose the boy’s religion. But it does have the ingenuity to discuss religion-related issues without disclosing the religion. According to the Herald Sun, a Facebook post by the boy read, “If you find a Muslim with a bomb, and report him to the police, you’re an apostate. By now you’d hardly be left wondering about the boy’s religion. With that missing piece of the puzzle restored, we can now turn our attention to the fact that the boy was not always religious. Religion has only become a recent obsession. Testimonials from “schoolmates” (most of whom, I suppose, are teenagers too) are significant enough to be worthy of public consideration. “Some of the accused’s former schoolmates…were shocked when the boy, who had always been a “good kid”, began posting radical views on Facebook late last month,” reported the Age. In fact, the Herald Sun has published an entire Facebook conversation between the boy and two of his friends. When anti-terror measures are broadened to include within their fold the normalization of “behaviors that are somewhat strange and not normal,” “terrorists” can be found even when there is no direct threat of a terror attack, as we have seen in most of Australia’s past anti-terror cases. A terrorist has been caught. An attack has been thwarted. Lives have been saved. But neither the “terrorist” can be attached to a person, nor the “terror attack” to a time or place. This abstraction of the “terrorist” from the person turns him into to an almost surreal being – he exists merely in some disembodied personality traits, which are predominantly defined by certain religious views and behavioral patterns as we have seen above. Therefore, the “terror threat” is automatically implied as long as the “terrorist personality” is kept alive in the public consciousness. Empirical details of the actual threat do not necessarily need to exist. In a way, the “terror threat” seems to reflect the “terrorist” itself like a mirror image. They are both ever-present precisely because their specific details are absent. Unrestricted by specificities, they break down the barriers between the present and the absent, the real and the surreal. Shafiul Huq is a Melbourne-based activist. He is also a student of Islamic Sciences and interdisciplinary studies covering the Humanities and Social Sciences.